I don’t even know how this book came to be on my radar – I just know that I had a picture of it on my phone and a couple weekends ago I was pleased to discover that Indigo had topped up my Plum Points and I had $100 to spend…but only that weekend to spend it. 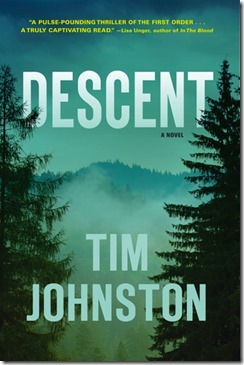 So, I flipped through the pictures of covers and chose five, Descent being one of them. A couple of weeks ago, I mentioned the book on Information Morning and decided that since I had, I should probably read it. Once I started, I couldn’t stop. The Courtlands are spending a little family time in the Rocky Mountains – a holiday before Caitlin, 18, heads off for her first semester of college. Her mom and dad, Angela and Grant, are clearly in crisis and then there’s Sean, Caitlin’s 15-year-old brother. …it came, monstering through the trees at an incredible speed, crushing deadfall, the whip and scream of branches dragged on sheet metal and then the suddenly unobstructed roar that made her wrap her head in her arms, the sound of tires locking and skidding and the thing slamming into what sounded like the sad tin post of a stop sign and then the meaty whump and the woof of air which was in fact the boy’s airborne body coming to a stop against the trunk of a tree. When Grant and Angela get a call from the local police, they learn Sean’s been badly injured; Caitlin is missing. Fast forward a year or so. Grant has moved to the area and is living on the property owned by the local sheriff’s father, Emmet. Sean is on the road, driving from place to place picking up odd jobs. Angela is living with her sister when she isn’t hospitalized for depression/mental health issues. Caitlin’s disappearance has fractured the Courtland family. It’s mostly the men that Johnston spends time with, allowing the reader a glimpse into their own personal hells: the father who can’t and won’t give up hope that Caitlin will be found and the son who can’t forget what happened that morning on the mountain. As for Sean, he is closed off from the world. In one particularly horrific scene, he puts himself in harm’s way in an effort to save a young girl – perhaps in an effort to atone for the ultimate crime of not being able to save his sister. It’s not the only time he does something selfless, albeit, foolish. I just wanted to hug him. We do spend less time with Angela, but that doesn’t mean that we know less about her. She moves through her much diminished world like a whisper. Only a parent who has suffered the loss of a child could truly understand Angela’s debilitating sadness. The girls’ heartbeat still played in her arms. In her chest. She remembered the hour, the minute, she was born: precious small head, the known, perfect-formed weight of it. All her fears of motherhood – of unreadiness, of unfitness– vanishing at the sight of that plum-colored face mewling in outrage. My child, my life. Secondary characters, Emmet’s black-sheep son, Billy, for example, are equally well-drawn. Billy arrives back in town, much to the chagrin of his father and older brother, and swaggers his way into everyone’s bad graces. But even Billy is allowed his shades of gray – there are no stock characters here. Into these complicated interior lives, Johnston deftly weaves the mystery of Caitlin’s disappearance. She is not a footnote, trust me. The story of her disappearance is unraveled with excruciating care and her story is definitely one of the things that will speed your journey through this book. Descent is fantastic on every level and I highly recommend it. This entry was posted in Book Chat and tagged 2016, Book Review, highly recommended, literary fiction, thriller by Christie. Bookmark the permalink.